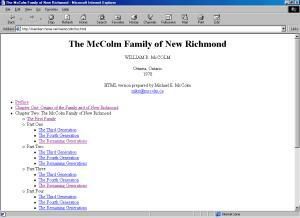 This web site was created to present the information contained in the book The McCOLM Family of New Richmond by William R. McColm. John McColm Sr., his wife Margaret Sinclair, and their children came to New Richmond, Quebec, Canada in 1833. The book, published in 1978, records most of their descendants. It's now the year 2018, and we hope that this web site will allow family members and relatives to update their branches of the family tree with any births, marriages and passings, particularly those subsequent to 1978, or with any other information they wish to share. If you have any information you would like to contribute, please send it via email to mike@mccolm.com or use this form to submit it via this web site. Thank you to all those who have already contributed! If you have any comments or suggestions about the web site, you can submit them using this form. 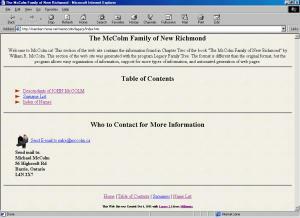 History of the name "McColm"